After interrogating Petre, the stables caretaker, about the murder (and finding out little), I decide to take my time and tour around the town. 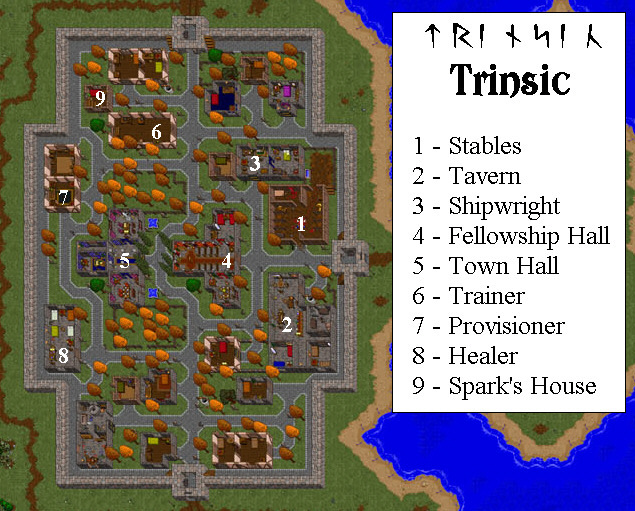 I know I’m spoiled from modern CRPGs and MMOs because I’m slightly frustrated by the lack of a town map that I can pull up. I guess I’ll work my way counter-clockwise through the town then, shall I? Next to the stables is the “Fellowship Hall” — which looks a lot like a church or chapel. I start chatting up a lady named Ellen, who has the unfortunate luck to have married a guy named “Klog.” Did she know that 20 years later, he husband would be the maker of a hit line of tacky shoes? Ellen says that the Fellowship meets to promote something called “sanguine cognition” in people. Sanguine? As in blood-red? As in THE BLOOD OF A MURDERED MAN AND GARGOYLE? Is it too early for the Avatar to just start hacking up people on a brief suspicion? No? Well… fine. I was sure “psychopathic mass-murder” was one of the virtues, but maybe I’m wrong about that. I still have my eye on you, Ellen. She tries to recruit me, but that’s a no go. I’m not joining an organization that sounds like they have Tom Cruise for a spokesperson. Speaking with Klog reveals that Christopher was a part of the Fellowship and had wanted to leave, a move that made the Fellowship none too happy. They got into an argument last week and Klog blames Christopher’s bad choices for his ultimate fate. Yeah, that’s really absolving you of all suspicion here, dude. Enough of that creepy place. I let myself out, scooping up a Fellowship staff and 100 gold from the poor box on the way. What? I’m under no obligation to be virtuous here! “Casual thievery” quickly becomes a running theme for me. Nobody seems to object as I loot their homes and places of business. Check out my stash! Also, how awesome is it that the save icon is an old 5 1/4″ floppy disc? That takes me back. I want to pause for a minute to mention the look of the game. It’s got this weird combination of top-down and isometric viewpoint that kind of works to give it a slight 3D look. It’s not 3/4ths isometric like Fallout, but I like it. There’s just a remarkable amount of detail here, from the shadows of the clouds passing overhead to all of the stuff in every building. And with all of the retro-pixelated games these days, it feels remarkably fresh. I’m less thrilled with inventory and object usage, however. All of your junk goes into your backpack, which is presented as a jumbled mess of teeny-tiny icons instead of being organized as a list or on a grid. More immersive? More frustrating, honestly. I found this little artist’s hovel where blank canvas and paintbrushes awaited me. Iolo even urged me to paint, so I picked up the brush and pigments and… couldn’t figure it out. 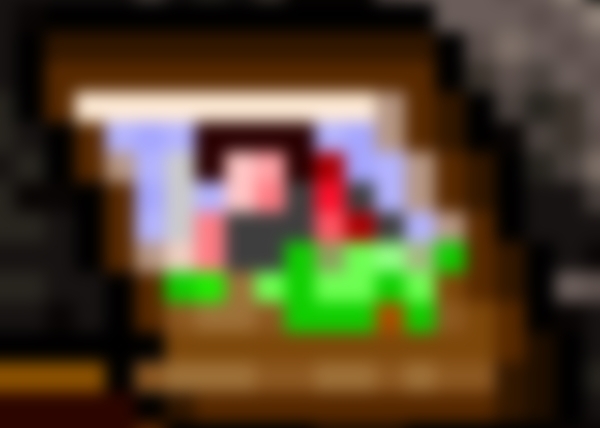 Double-clicking on the brush turned the cursor into a “use” cursor, but it didn’t do anything when I clicked on the easel or pigments. What am I missing? I almost went mad standing there, clicking all around like a madman, trying to figure this out. Never before in my life have I wanted anything as bad as to make my little character paint a picture. WHYYYYY. OK. Whew. Think I figured it out. I had to double-click the brush, single-click the paint, and then click on the easel several times in a row. Gradually, a portrait takes shape. Dang, I’m awesome! And I’m apparently painting the same thing over and over again. Iolo makes some crack about painting by numbers, but that makes sense. That? That was pretty neat. The game let me paint! I’m beside myself with amusement. Picture unrelated to post. Does TSW have some sort of strange teddy bear conspiracy, however? Our cabal convened for another nightmare dungeon last night, this time heading into the Darkness War to prove our stuff. We’d heard that this was somewhat easier than nightmare Polaris, not to mention that it’s a favorite of ours in general. All in all, the run went great. We plowed through five of the six bosses, gradually figuring out the strategy and fight patterns of each boss. The stupid Ak’ab boss proved to be the trickiest — there’s just less space to run around in and his underground attack kept knocking us out. But he, like the others, went down. I had a stupid moment during the run. I used my turret/manifestation build for the first boss, as it’s great for fights with tons of adds. Then when I switched back to the strike build that I made to beat Gatekeeper, I accidentally overwrote that build with a copy of the turret one. We didn’t have time to sit around while I remade it, so I was saddled with an older strike build that was less than optimal. While that was a bummer, I did tweak it a bit to include a couple of purges that were pretty useful in the fight against the mad bomber. Speaking of the bomber fight, that was another tricky encounter that kept wiping us. We were getting the hang of it, however, when we went into the fight and he didn’t do any of his normal abilities — he just stood there and kept hitting us. Obviously the encounter had glitched, but we are not so proud as to look a gift horse in the mouth and we took him down hard. When he died all of the adds and shields happened at once, but by that time it was too late. I ended up with one purple talisman upgrade for the run which made me pretty happy. Still hoping and waiting for the day that I can finally swap out my blue QL10 shotgun for a purple! 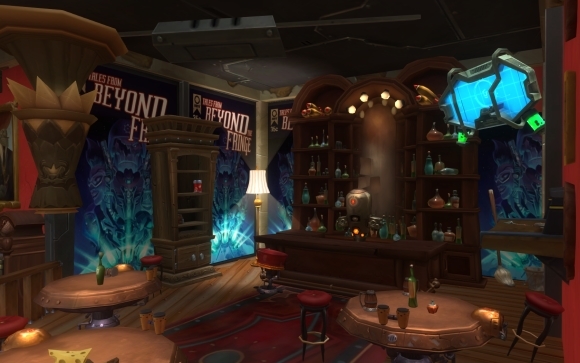 A guildie was taking me through his house in WildStar and I was suitably impressed at how much effort he put into it that I had to take this screenshot. Sometimes I really wish I could send messages back to my teenage self in the late 80s/early 90s consisting of advice on what games to play. Information about current and upcoming games were really limited to whatever I might encounter in the store and in gaming mags. Looking back, I know I missed out on a lot of so-called “classic” games like Final Fantasy VI and, well, pretty much every Ultima game. Really, I wasn’t even aware Ultima was a thing. 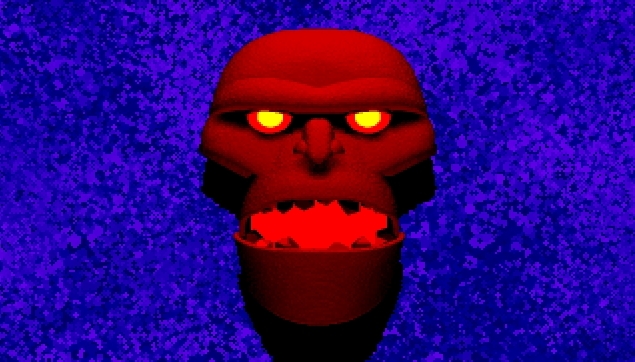 I played one of the Ultima Underworlds at some point, but that was just a dungeon crawler and didn’t indicate that it was part of some larger franchise. 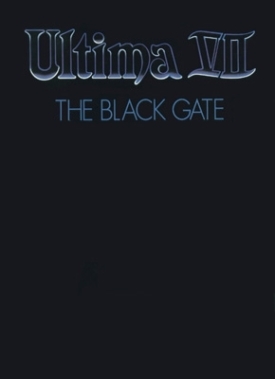 Thus, I’ve really been meaning to get to the Ultima series for one of my playthroughs. I now own all of them, 1 through 9, but I’m going to start with 7 due to many sources telling me that it was the best of the series. 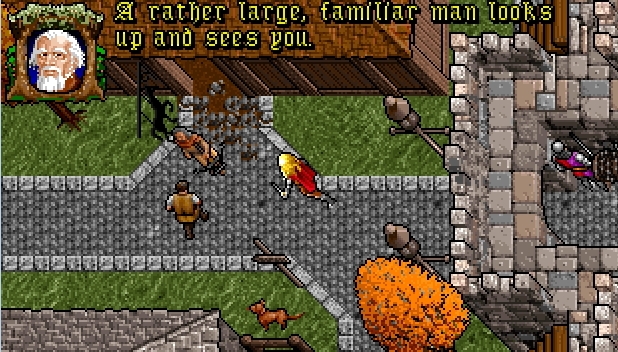 I hear good things about 8, too, but 7 was a smash hit in CRPG terms, with a sequel (VII part 2) and an expansion for each part. Thank GOG.com for giving me all of that in one go. While the manual to the game is this huge beast, I’m glad that there’s also a shorter “reference card” that’s a six-page document giving all of the basic controls and leading you through the first few minutes of the game. 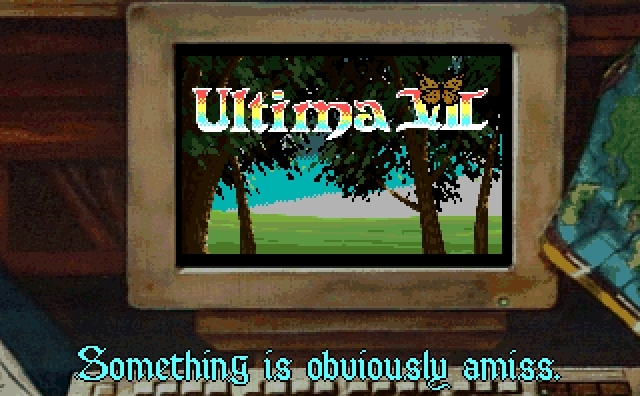 I’m happy to see that Ultima VII is entirely mouse-driven, so let’s see if we can get the hang of it! I must say that I’ve been looking forward to play this since putting it on my personal schedule a couple of weeks ago. 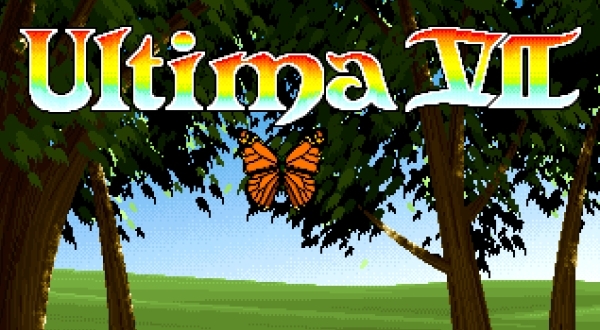 Ultima VII has one of the trippiest game openings I’ve ever seen. It starts out with this saccharine-sweet title screen. Look! Rainbows! Butterflies! Happy music! He’s the Guardian, or so he says, and he’s fully voiced. He’s there to say hi to the Avatar (which I guess is me) and to say that a new age has hit Britannia — one that he intends to rule. The Guardian doesn’t strike me as overtly evil until he starts in with the standard maniacal laugh before the screen fuzzes again. 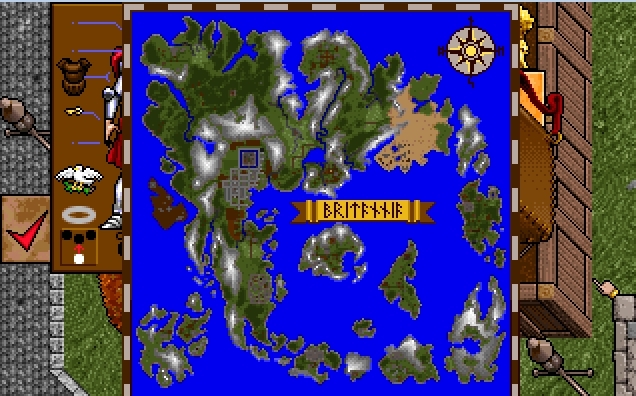 Also, Britannia? How long did it take you to come up with that name? Were Australianna and Finlandnnia and Mexicannia taken? You don’t say. For one thing, I’m now playing a character who’s playing the game inside of the game that I bought. It’s so twistedly meta I don’t know where to begin. For another thing, I apparently have a 486 pentium. I guess my computer time-traveled back to the early 90s. Fortunately for the apparently dire state of Britannia, there’s a Moongate in my backyard. 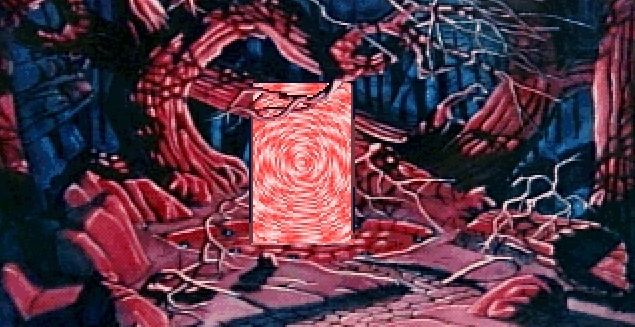 You know, that comes standard with all suburban tracts these days: evil forest, twisted trees, moongate to another world. Syp pops out of the moongate and into a medieval town where the locals are talking about something super-duper shocking. This is Trinsic and the fellow is Iolo the bard, who I guess is also from earth because he does this little aside where he spills a few relevant details. It’s 200 years after the events of Ultima VI, but both he and I don’t appear to have aged to the locals. Loving the graphics and the music so far, but egads, I could do without that Ye Olde English font. It’s a little hard on the eyes with the resolution and all. Huh — there’s a murder afoot, and Sherlock Syp has been asked to help out. I dost! I dost accept! …Although I’m a little curious what would happen if I said no. Would that break the game? Gotta say, this is not what I was expecting. A guy ritually staked to the floor and either de-limbed or stabbed so many times that it doesn’t make much of a difference? I snag a nearby key and really hope that I don’t have to clean up this mess as part of a virtue. Because standing over a gruesomely mutilated corpse is the right time for this sort of thing, I spend a few minutes investigating my character sheet and inventory. My backpack already has a few supplies in it, including a torch, food, and this colorful map of the world. Enough of that, I suppose. Beyond the dead man — Christopher — is another room with another murder. There’s a gargoyle who’s been pitchforked to the wall. Nasty business, that. I loot his bag and take a piece of jewelry nearby, then get into a lengthy conversation with Iolo while ignoring all of the flies. Iolo gives me a few potential leads while saying that Britannia has changed somewhat over 200 years. People are more defensive now and the towns are larger. He wants me to go to Lord British’s house, who apparently is deep at work on some revolutionary new invention called “Tabula Rasa.” OK, I made that last part up, but I need to start purging these Richard Garriott jokes early and often if I’m going to make it through this series! Yesterday was a strange day for gaming in that I didn’t do any one big thing but a lot of small things. I added to my GOG.com library as I picked up a few titles on sale: Wizardry 6&7 and Deus Ex: Game of the Year Edition. Seriously, Deus Ex for $2 — and it came with the full soundtrack, which I’m discovering is a pretty awesome OST. I’m making great headway on finishing up my virtue deeds for Moria on my Lore-master in LOTRO. A few more and I’ll be done with there for good. I must admit that my kin is a strong motivation for logging in every day, as they’re very friendly and chatty. It makes riding through the Foundations of Stone a light-hearted experience. I had intentions of giving RIFT a serious try last night. I created a new mage and ran her through the streamlined tutorial, but then when I tried to log on to my other characters to transfer funds and the like, the game kept hanging on the loading screen. I don’t know what that was about, but I got frustrated and logged out since it was getting late. So instead I moved on to another Trion Worlds title: Trove. The extreme alpha-ness of this game keeps me from logging in, but I can already see the potential for some serious fun here. Already my character has pets and some outfit options, and I just ran around checking out what others have done with their cornerstones. 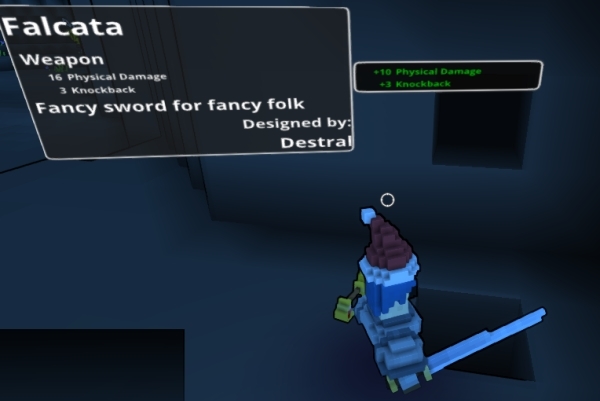 The Knight is a pretty boring class, so I can’t wait until they bring in the next one (Gunslinger), but he was pretty happy to find a player-designed sword during his adventures. I never did find a place to plant a cornerstone of my own, but I also haven’t accumulated a lot of building materials yet either. This will be my final Wing Commander post for a few reasons. I wasn’t planning on stopping here, as it’s certainly not a bad game, but I’m at the point where I don’t think I can squeeze much more out of it in terms of interesting posts. The structure of how the game works is pretty apparent and keeps repeating over and over again — fights, slightly different challenges, other pilots hinting at foes you’ll face or tactics you should use, eventual promotions for kills, and the whole win-lose mission branching. 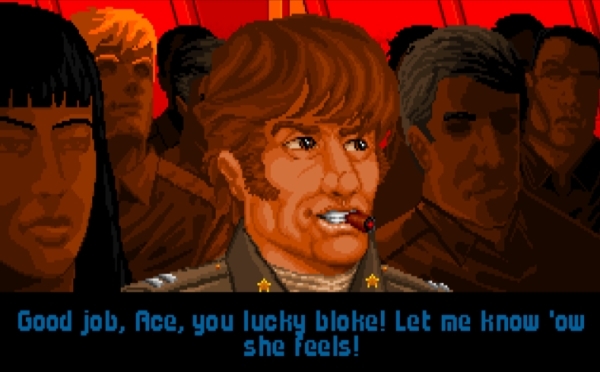 But what Wing Commander really doesn’t have is much of a story, and that’s hurting my enjoyment of it especially as I remember WC2’s tale with greater fondness. The space flight portion is solid and occasionally engaging (there’s a particular thrill when I get a good shot lined up and blast through an enemy ship), and for the era, it’s pretty amazing how much mission variety the designers got out of the game. I don’t think there’s much more to say here. 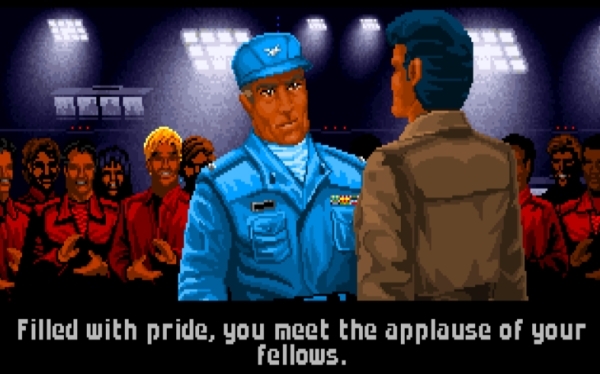 Wing Commander deserves a lot of the praise and recognition for what it did, especially when viewed in light of its contemporaries in 1990. It strived to create a “full package” experience that reacted to the player’s achievements, created an immersive environment of space war, and boasted a (still) pretty challenging experience. I’m sure I’ll get back to this series one day, but for now it’s time to trade my space boots in for something a little more… fantastic.